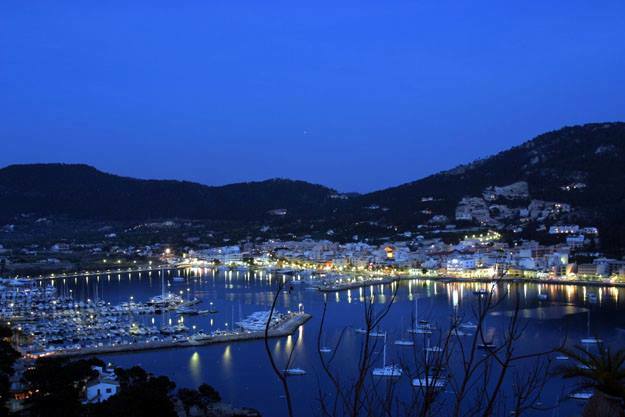 Port d’Andratx, a picturesque fishing village as well as one of Mallorca’s classiest holiday destinations. Popular with the yachting fraternity and film stars whose Italian-style villas can be seen climbing up the hillsides, it also has a working fishing industry that supplies many of the port’s restaurants. Located in a stunning coastal stretch, at the bottom of a funnel-shaped valley, lies Port d’Andratx, a harbour claimed by many as one of the prettiest in Mallorca. The main town, built in the mid 20th century, is located on the southern side of the port and retains its character thanks to the presence of fishermen. In the summer, this side of the harbour has a wonderfully bustling atmosphere thanks to the lively bars and restaurants that line the water’s edge boasting wonderful sea views amplified by the many yachts mooring in the bay. Although the port is quieter in the winter months, with many restaurants closing between November and March it is still a nice place to visit as it appears to revert back to its roots as a small fishing port. The Club de Vela marina on the north side of the port has a distinguished cosmopolitan legacy. It is also the biggest attraction in the area for some of the most affluent individuals evident by the number of larger yachts dwelling here. Many of them also own a villa on the surrounding hillsides. Speaking of the area’s inhabitants there’s a mixture of local native Mallorca inhabitants, international expats who have retired to the area and, of course, some holiday home owners who come and go throughout the year. The town has some nice buildings solely dedicated to apartments, whilst villas dot every conceivable space on the surrounding hillsides from Port d’Andratx to the ancient rural town of Andratx about 5km away. This area of Mallorca is also blessed with glorious countryside, which attracts many visitors keen to explore some of the island’s natural beauty.